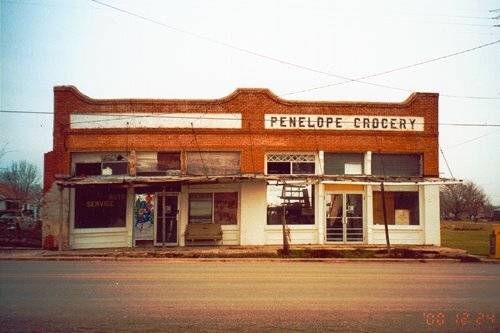 "She was only the Railroad President's daughter�"
Penelope would be our choice for a black-prairie, cotton town study. Many artifacts remain from its cotton producing heyday, including not one, but two cotton scales. The first settlers in the area owned a ranch that was about � mile from present Penelope. Penelope Trice was the town's namesake and although she sounds like a character in a Dickens novel, she was the daughter of the president of the International-Great Northern Railroad. The railroad came through the town 1902, the same year they got a post office. 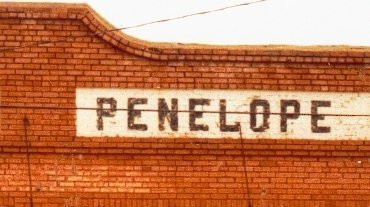 Penelope's history is nearly a repeat of the history of Venus, Texas up in Johnson County. The same railroad featured in the lives of both. The town incorporated in 1913 and many Penelopeans were Czech immigrants. During the brief period of prosperity, Penelope had 20 business and 400 people. Today it is about half that. "Clean-up on aisles 1 to 6"